Walpurgis Night on April 30 is an old pagan festival, which borrowed its name from Saint Walburga whose feast occurs on May Day. On this night witches are believed to ride on broomsticks to places of old pagan sacrifices in the Harz Mountains, especially to the Brocken. The Brocken, the highest peak in the Harz Mountains, is considered the focal point of Walpurgisnacht. Also known as the Blocksberg, the 1142-meter peak is often shrouded in mist and clouds, lending it a mysterious atmosphere that has contributed to its legendary status as the home of witches (Hexen) and devils (Teufel). There, they dance around a huge fire and worship their lord the devil, who bestows them with new magic power. 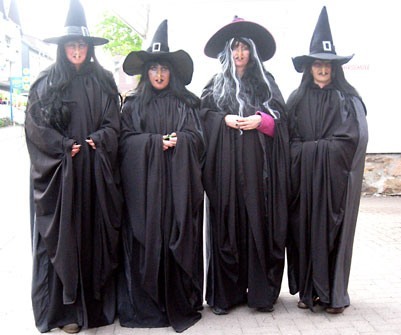 The writer Johann Wolfgang von Goethe (1749-1832) in Faust writes that the witches come on Walpurgis night and sing: “Now to the Brocken the witches ride; the stubble is gold and the corn is green; There is the carnival crew to be seen, And Squire Urianus will come to preside. So over the valleys our company floats, with witches a-farting on stinking old goats.” Follow this link for further information . . .